Like many amateur genealogists, I became interested at a family reunion. I looked around the room and saw the same nose and chin on many faces, and I was hooked. Where did those features come from? Which families combined to produce my mother's beautiful long thin nose and that apple dumpling chin that was apparent all over the room? Since then, this search has led me to the Caldwells, and then my other families. I have visited many of the places they lived in America. It has also led me through the annals of our country, as my ancestors were here early in the country's history. Some of my families travelled to one place and are still there. Some families followed the homestead acts, using very common migration paths throughout America. Some families were risk-takers and some were not. Some Caldwells went from Alabama to Oklahoma to escape mining, and most of them went back to Alabama when they discovered the barren dust bowl that Oklahoma became early in the twentieth century. On the other hand, the Betheas were in Marion County (now Dillon County), South Carolina before the Revolutionary War and they are still there. My Williams family has moved very little in almost 300 years, from near Jamestown to Sampson County, North Carolina, then to Cumberland County next door. The Israels moved all over the place, as did the Wheelers. The variety of origins, location, amibition, and attitudes is apparent in the choices each family made. When my brother and I visited the Israel land in North Carolina, we literally felt a chill as we crossed the ridge onto their land. I have learned that my family settled and lived in places where I feel comfortable, drawn, peaceful. I liked these places even before I knew they were ancestral stopping over places or final destinations. The crazy place called South of the Border may be a rest stop on I-95 to millions, but to me it is the entrance to Dillon County, where my people are. This can never be adequately explained. It just is. Sometimes people ask me why I want to know about ancestors, why they matter. First, I have learned how I am connected to America's history and that history has come alive for me. Second, I have come to understand how choices are driven and have learned a lot about people. Finally, I have learned how much we are a product of all that comes before us, and that may be the most important lesson of all. Houses and other places often are the beginning of stories. The house pictured above is one of those. Julie and Ben Caldwell lived in Pleasant Grove, in the western part of Jefferson County, Alabama. 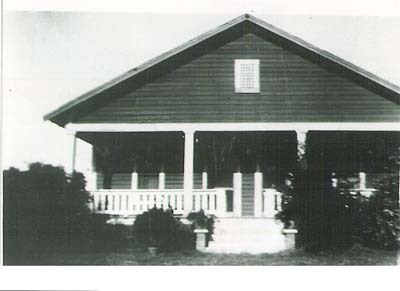 This home still stands, but in a different configuration, surrounded closely by other houses rather than standing free in their small farm and fields. The cousins who are the grandchildren of Ben and Julie remember spending summers there, sleeping on the porch, roaming through the woods. Many members of the family were within walking distance, so there was much visiting back and forth. My mother's home was just down the hill, and she lived her childhood back and forth between the two houses. After seventy-some years, she remembers details, like that the doorknobs in the house were low enough for a small child to reach. She remembers special food, playing with cousins, and sleeping over. She also remembers the chores of a family where daddy worked and everyone contributed to raising food for their table. In her lifetime, they slaughtered hogs and canned most of the food they would eat through the winter. Her mother did that into her seventies. These were families a generation or two removed from pioneering, still very much tied to the land. Accuracy Some of the material on this site is very accurate, cross-referenced and sourced. Some is still in work. At the top of each family page, I have indicated which is which. For instance, the Nicholson family is highly accurate for six generations. I have included a link to earlier generations that may or may not be accurate. In each case, I have described what I know and what I do not know to the best of my ability.. I have also indicated where there are varying stories and I believe I have ferreted out the truth. If you wonder about something, write to me directly. I am doing this and going to school, so the web site likely lags my knowledge. Stories I have tried hard to include stories about individuals, even if they are small stories. I ask my mother countless questions about people so I can capture some flavor of their lives and persons. I research on the internet, particularly in Google books where I can find old manuscripts. Where family members have lost memories, they can still tell me a snippet. My father remembers the summer he picked cotton, not with a great deal of fondness. Apparently he had misbehaved and his family left him with grandparents while they went on vacation. Someone figured honest labor would benefit him, so labor he did. Gradually a tale like that fills out and becomes a story of his summer. Curiousity Some stories beg questions about the people involved. Here is a for-instance. In May 1829, Richard Wheeler paid a bastardy bond for a child with Rachel Church. In that same year, he skipped over the state line and married her sister Sarah Catherine, who does not appear to have been with child at the time. I would love to know what happened! In the summaries at the top of family pages, I have included these questions. I hope the stories pique your imagination and make you wonder also. Bravery: The American Story I am struck by the bravery of the American pioneers, and not just those who went west. Can you imagine setting out from Lancaster County, Pennsylvania, somewhere around 1730, heading to a place in Virginia that is still extremely remote? Members of that colony were practicing Presbyterians, in a place where they had to get permission to practice that religion. Today that area of Virginia is full of rolling fields, but there are also forested areas to remind us that the men had to fell thousands of trees to build their homes and plant their crops. There was nothing there in the early 1730s except woods and a few creeks. How did they get the nerve? Confusions Genealogy on the web has lots of confusion. Anyone can post anything and everyone can copy what anyone else posted. Thus mistakes are carried forward. Sometimes, various versions of a life are perpetuated. In every case where I can, I have tried to resolve the diferences. For instance, William Richardson Nicholson's year of death has been variously reported as 1850, 1859, 1860 and 1869. I think several of those dates may be typos of others. On June 26, 2008, a very nice man went to the forested Nicholson cemetery and took a picture of the tombstone, which clearly says June 26, 1869. Supported by an entry in the marriage register of Dekalb County for 186?, I believe 1869 is the correct date. This is the best I can know without actually having been there. Sources and Senses At the end of each family genealogy page, I have included all of the sources, the endless list of census pages and so forth. Read it or don't read it -- it tells you why I believe things are a certain way. Within individual entries, I also explain why I think someone was a child of the family or not, or why I think a child died before becoming an adult, or why I think two people were married. Some families are well-documented and some are not. For some families, I found newspaper articles, articles in books, or entire books. For others, I could scarcely find anything that admitted they lived. What I have is listed. In some cases, I simply have a "sense" of what happened and I report it as such. I have a sense right now that Alexander Caldwell may not have been married three times -- one supposed wife may have married his nephew. I am exploring that to determine who really married whom.